AQS are Confined Spaces accredited and so therefore can carry out servicing of underground and underwater plant equipment such as fountains. 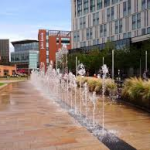 Liverpool City Council appointed AQS to undertake the full service of the fabulous water feature, located in the heart of the city. For more information on Fountain Service and Maintenance please contact us.